In an era of high fuel and electricity consumption costs, automation of building doors and windows for smart HVAC systems lowers energy bills by eliminating wasted power consumption. Nowadays main entrances are being upgraded to fully automatic doors. These systems allow for more foot traffic to and from the main entrance of the building structure, and give spaces a modern look and feel. In the summer, moisture will typically flow into an air-conditioned building, increasing humidity and requiring dehumidification. In some building types and climates, dealing with latent heat may be as big a problem as dealing with sensible heat. For this purpose, GEZE has developed a streamlined classification of automated door systems that eliminates waste by monitoring and controlling movement of doors and windows. These technologies are employed to maintain proper egress, integration with the building access control systems as well as to improve the buildings overall energy efficiency. The fully automatic door with movement detectors is suited for high access frequency. Thus this revolving door offers maximum comfort and smooth and trouble-free passage. These door systems can be produced up to a maximum inner diameter of 3600 mm. The automatic revolving door is activated via inside and outside movement detectors. Upon activation the door accelerates and rotates at an automatic speed. The automatic speed is adjustable and the time delay can be freely adjusted for the modes of operation i.e. longer delay in the summer months and no delay in cooler temperatures. As a further option a disabled person's button can be installed on the inside and outside of the door granting even better access control. With this switch, the revolving speed is reduced to allow wheelchair users or people who have difficulty walking to pass through the revolving door without any problems. The opening/closing time can also be adjusted. At the end of the time delay the revolving door reduces speed in all operating modes and stops in the final position, where the door leaves seal tightly against the side walls, thus leaving all environmental influences such as draughts, exhaust gases from vehicles, hot and noise outside the building. Due to the symmetric construction, the drum of the revolving door is closed by two leaves, which results in an improved protection against environmental influences and an improved air trap effect. 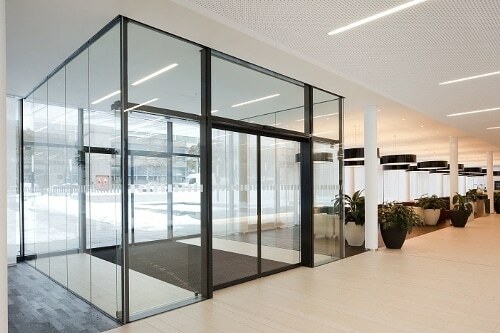 The other advantages of a revolving door with regards to the energy saving aspects is further reduction of energy loss in the entrance area by up to 50 % compared with a sliding door; the penetration of draught can be reduced from 7 m to 60 cm. Automatic sliding doors are space-saving, elegant and contemporary. Glass sliding doors are ideal when it comes to making good use of daylight and where optical criteria have to be fulfilled. Automatic sliding doors from GEZE can be used to implement the widest range of application requirements within a building. The variants in the Slimdrive series with an overall height of only 7 cm blend perfectly into any building's architecture and offer a wide range of application possibilities. ECdrive operators are economical and extremely reliable in their functionality. Powerdrive operators are real power packs and are capable of moving heavy doors conveniently and safely. Functions that can be realized on GEZE Automatic sliding doors are automatic adaptation to traffic flow, automatic reversal when an obstacle is detected, pharmacy opening, air sluice function, vestibule function, automatic opening or closing in the case of a power failure. With GEZE automatic sliding doors, the system can be configured such as one door only opens if the other is closed using the same program switch. In this function, the transfer of different temperatures (inside and outside) can be limited.